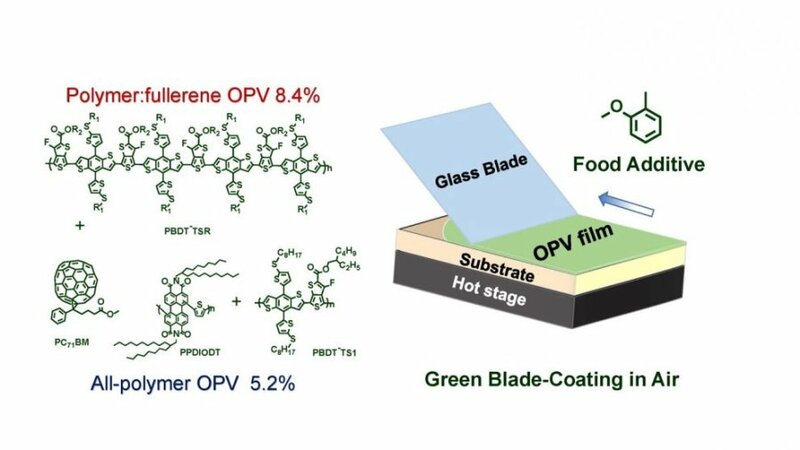 Researchers from North Carolina State University and the Chinese Academy of Sciences have created an efficient, semi-printed plastic solar cell without the use of environmentally hazardous halogen solvents. These solar cells can be manufactured at room temperature, which has implications for large-scale commercial production. Schematic illustration and chemical structure of semi-printed plastic solar cells in air, using food additive o-MA as solvent. Plastic solar cells, or organic photovoltaics, are popular because they are lightweight, flexible, transparent and inexpensive to manufacture, making them useful in multiple applications. Unfortunately, the halogen-containing solvents used in their manufacture are an obstacle to large-scale commercialization. These solvents are key to making sure that the solar cell’s morphology, or structure, maximizes its energy efficiency; however, they are environmentally hazardous. Additionally, the use of these harsh chemicals requires a controlled environment, which adds to production costs. Long Ye, a postdoctoral research scholar in physics at NC State and lead author of a paper describing the work, wanted to find out if nontoxic solvents could provide equally efficient morphology in the manufacturing process. Ye and his colleagues developed a proof of concept semi-printed plastic solar cell that utilized o-methylanisole (o-MA) as the solvent. O-MA is a commonly used flavoring agent in foods, and is nontoxic to humans. The researchers used soft X-ray techniques to study the morphology of their solar cell. They found that the o-MA based solar cell had similar morphology, crystalline features and device performance to those produced by halogenated solvents. The solar cell’s overall efficiency rating was around 8.4 percent. Furthermore, their cell could be produced via blade coating at ambient, or room temperature. Blade coating is a process that uses a glass blade to spread a thin layer of the photovoltaic film onto either a rigid or flexible substrate, and the process is compatible with large-scale commercial manufacturing. The work appears in Chemistry of Materials. Materials provided by North Carolina State University.